Gorgeous Things' Blog | Fashion, Fabric, and Fabulosity! You can now find my blog Here at Gorgeous Fabrics! I’ll be tweaking it over the next few days, but please reset your pointers to this address. I promise this will be the last move for a long time – hopefully ever! Nothing bad, but when I did the post complaining about the no-advertising fees, the wonderful Leslie (my web developer) came to me and said she could move the blog to Gorgeous Fabrics and free me from ever having to pay to keep it ad-free (wish I had thought of that before I shelled out the money – oh well, live and learn. And that’s no reflection on Leslie). And honestly, this week has been rather hellish, so I haven’t been able to sew anyway. And my life is not interesting (Want to hear about my trips to the gym? My interactions with customers? No? I thought not). So nothing to report, but I am still here, for a few days. I will warn you – I’m going to move the blog one more time. I apologize for that in advance, and I really, really appreciate your patience with me. This will be the last move, I promise. The next post will be broadcast live from Gorgeous Fabrics Galactic Headquarters! Check out this fabric that we just got from the atelier of the couturier on the Rue Cambon! This is so gorgeous. What you can’t really see well from the photograph is that the backing fabric is a deep, rich burgundy, with these big fluffy yarns “floating” on top. It’s dear, yes, but my goodness, this is the real deal, and it will make a jacket you will wear for years! But the real reason I’m pointing it out is because I was only able to get 15 yards, and it’s already starting to sell! So if you want the real thing from Coco’s atelier, don’t wait. This one is too beautiful to pass, and it won’t last. 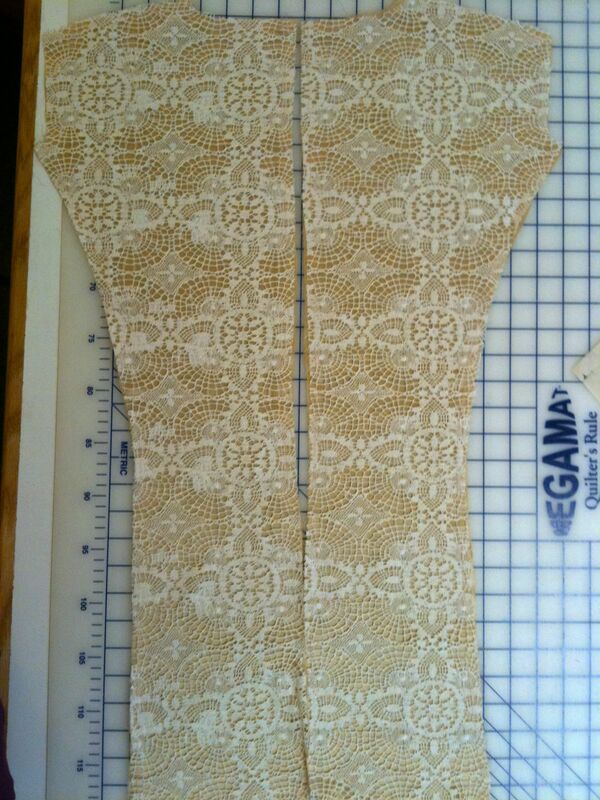 Will get the lace trench finished. Here’s where life stands thus far. DH’s job is insane right now. He’s the tech lead for getting the websites up and running for one of the largest H&B companies in the world. The good news is that it will (touch wood) keep him employed for at least the next year and a half. The tough part is that I have to pick up the slack in child care, after-school shuttling and homework helping. Add to that the 60+ hours a week that I spend on Gorgeous Fabrics and it doesn’t leave a lot of time for sewing. Don’t get me wrong – I’m not complaining. I’m incredibly grateful that he has a job he loves. My kids are great – most of the time. And I love what I do. But I get to sew in sips rather than in gulps. 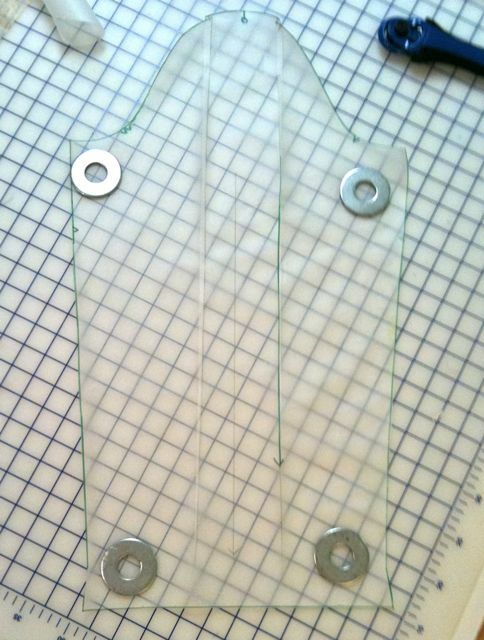 I’m using a light pink thread to baste inside the seam allowances. 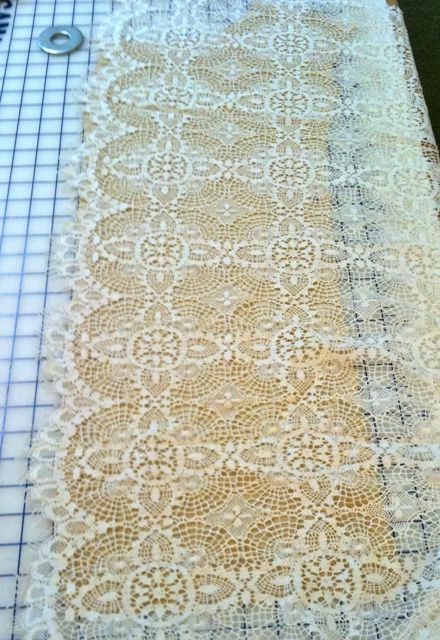 I think I’ll tack the lace to the underlining in the body of the pieces too, and for that I’ll use thread to match the lace. I’ll try to get more done tomorrow (riiiiiiight). I’m still working out in my head how I’ll place the fronts on the lace. More on that later! I didn’t take a picture of me in the final muslin, because I can’t take mirror image pictures of myself with my cell phone. They just look awful. But the results look good, and I went ahead and started cutting while the Pats gave up 14 points in the third quarter (we need to work on defense, guys). 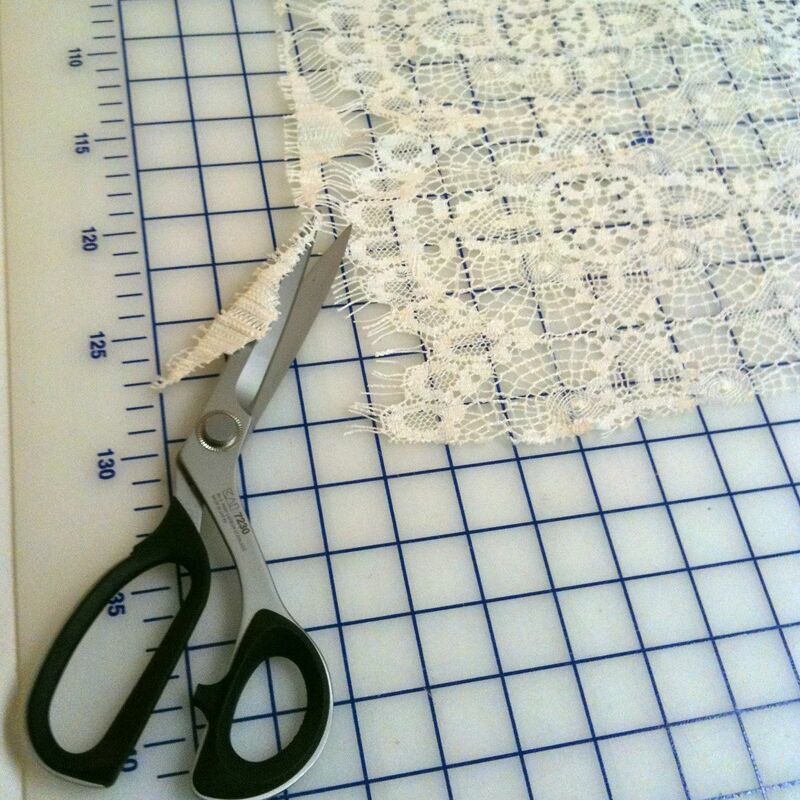 I’m making this with an ivory French Lace that has been aging in my stash for a while. I’m underlining it with a champagne stretch silk charmeuse from Gorgeous Fabrics (sold out, sorry!). I’ll use silk organza for interfacing and Wide Silk Habotai in Oyster for the lining. I think I may use some very cool large snaps in tortoise for closures, but let me get through the majority of the construction before I make that decision. I need to cut the lace, and I need to do some serious thinking about how best to construct this, so it will take me a while. But slow sewing is a good thing, especially in the fall, right? And I want this to look utterly spectacular when I wear it. The gala is in November, so I have some time to get it right. I had a couple of interesting experiences recently. First is the close call I had with the Lady Gray muslin. I’ve decided to make the McCalls instead, but I was mildly disappointed, not with LG, but with myself. I’m glad that I’m self-aware enough to know when something really doesn’t suit me. But my disappointment stemmed from the fact that LG would look great on me 20 years ago. I was a size 4 (in 80s sizes, not today’s). I was tight, taut and toned. I’m still pretty tight, taut and toned, but gravity and two kids have done their jobs. The second experience has to do with makeup. The other night I went to the store to buy makeup for fall. I decided, kind of on a lark, to go “au naturel” – no wig. I wanted to see what colors the makeup artist would recommend based on my true colors (as a corollary, it’s going to cost a bloody fortune to get my hair back to its “natural” color). The colors she recommended surprised me. They were very different from what I wore in the past. And frankly? They look fantastic. (Note to self – put self in the hands of a makeup artist more often.) I don’t know about you, but I have been wearing the same color eyeshadows for about 10 years. I think I looked pretty damned good, but I didn’t evolve very much. Working with the makeup artist was, shall we say, an eye-opening experience. So the point is to open yourself up for reinterpretation. I’ve had some pretty extreme changes in the last year. Have you? If so, embrace them! Adjust your pattern choices, color choices, makeup choices, whatever – to suit the now. Try new silhouettes (make a muslin first to make sure you like the results). Change the waistline up or down from your norm. Go to the most expensive store in your city or town and try on new stuff to see what you like. Take pictures of yourself from the neck down if you’re trying on something new, and see how you like it on your body without being distracted by your face. You might be completely surprised to find that you don’t like something that you have been wearing for a while. And you might find yourself surprised to love something that you never considered before. Deal. You know who you are. Fashion’s Night Out Flash Sale on Shirtings at Gorgeous Fabrics! Tonight is Fashion’s Night Out, a celebration of all that is fashion, all over the US, and elsewhere! And to mark this great fun time, we’re putting all our shirting fabrics on sale for 4 hours only tonight for 15% off our regular great prices! So get your Thomas Pink on and get yourself some fantastic bargains on fabrics that are the mainstay of any wardrobe. The sale runs until 10:30 PM Eastern tonight (September 10), so have fun and enjoy! For those who were expecting the sale to start at 5, my apologies. We had a minor family emergency (DS with stomach flu) that needed attending first. I’m still floating on air after my appointment today, and I only have a few minutes to post, but I wanted to give a big shout out for Pam’s new website, Fashion Sewing Supply. First I need to disclose: Pam is a good friend of mine. But even if she wasn’t, I’d still plug her site. She has the Best interfacing I have ever used, and I’ve used all of them. I’ll be using her interfacing for my coat, once I’m back in the sewing room. So if you need interfacing, I strongly recommend her site. I had a follow-up with my medical oncologist today. So far everything looks great – all the bloodwork is normal. Fingers crossed!! !